THE WRITING BUDDHA - Opinions | Books | Movies: Decoding Life by Vikas Singal (Book Review-2.5*/5)!!! 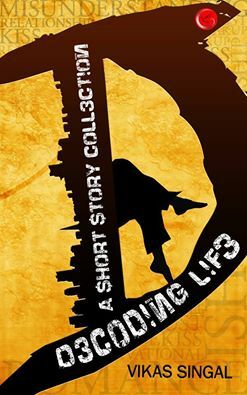 Decoding Life by Vikas Singal (Book Review-2.5*/5)!!! This is the second work of Vikas Singal that I have just completed reading. 3 months back, I had read the e-book released by him which comprised of 3 small love tales. I had a complain that his stories were too short to communicate anything and I'm bit happy with the progress he made in this anthology named "Decoding Life". It comprises of 10 short stories which are based on different topics and it's surely better than his first attempt. Generally, with anthologies, you find that they aren't edited well but I congratulate Singal's publisher- Gargi who have assured that the book isn't badly formatted and grammatically incorrect. The first story, Taxi Driver, shows how out of fear a girl runs away from a taxi driver when he halts for a few minutes. Later, author shows how all men are not the same. For me, the best story is "A Rain Kissed Tuesday". The emotions that this story carries is almost similar to what many Indian authors are doing with their 225-pages book. Author managed to do it in few pages itself. K N Laxman is another good story in the book which shows how people think everyone is selfish even if few people are genuinely good and caring. Glad That We Met is another story which will make you smile at few scenes. The Mistake serves its conclusion well. Two States is the worst attempt according to me. Author could not link the two situations together perfectly. I was expecting little masala from The Train but it ended being too sweet. Book ends with That Mystery Girl which is quite similar to Taxi Driver where author tries to tell how every girl isn't flirty and date-friendly. The attempt by Vikas Singal is honest and you can find the same in every story. To release a book with 10 short stories by a single author is a wonderful idea but then it should be taken care of how many stories are par excellent. I found almost 70% of the stories mediocre. I was expecting little more length from the stories even this time. Author had a conclusion in his mind and he wanted to reach to it in as less words as possible. He should attempt long version of short stories now. But I genuinely liked 2-3 stories and they shall remain in my mind for days. My favorite is A Rain Kissed Tuesday, The Train and The Mistake. I give the book 2.5 stars out of 5.